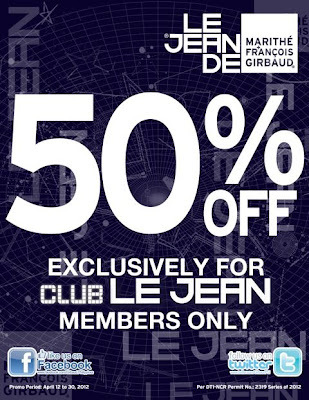 Girbaud offers 50% discount exclusive to Le Jean members! Hey Coffeeholics! Check it out, another sale alert again especially for all Le Jean Members. While sales have become synonymous to long weekends, Marithe + Francois Girbaud shows that you don’t have to wait for the next long weekend just to get a great deal! Girbaud offers a 50% discount on its best-selling accessories and all basic jeans and knits for men and women, exclusive to the members of its loyalty program, Club Le Jean. So dear Coffeeholics, don't forget to check out Girbaud branches today! Or better yet, be a Club Le Jean member. Happy shopping!